I took a walk and couldn’t help but notice the almasigo and ceiba trees have begun to sprout new leaves and ducks have their nests full of eggs. Over the years the more connected I become with malongo, the place where the medicine is, nature, the more I understand the cycles of nature and how they affect us. This is what we are supposed to do as initiates, observe malongo and learn from it. We observe the different ways the Earth reacts at different phases of the moon, at different times of the day and even in how things are affected by the position they are in and the direction they face. My observations were made right as “Cuaresma” or Lent came to an end. Lent, Holy Week and Good Friday have all become important topics in the Palo and Lucumi religious communities. As of late more and more practitioners in the United States are moving away from observing what were typical practices of our ancestors during Holy Week. Historically Palo was only practiced during this time of the year by those who were considered “ndoki.” The context of this word, while having different meanings throughout the Bantu speaking world, refers to negative witchcraft, sorcery used to harm. Ndoki was always notable by the absence of Catholic iconography. Today however, this is not the case. There are many practitioners working throughout Holy Week and Good Friday and it’s not necessarily to do harm. Also, the absence of crucifixes and Saint statues has more to do with revisionism due to political agendas than anything else. Practitioners are trying to get back to a more African uncreolized Kongo tradition and call it Palo. This is however, an oxymoron. Revisionism is a slippery slope, especially when based on speculation. Many have made the assumption that the Kongo was pillaged, slaves were taken to Cuba and they were forced to adapt Catholicism senselessly. A deeper study of the subject however may lead one to believe otherwise and merits more attention. To begin, this belief that all Africans were forced to be baptized is due to the propagation of erroneous scholarly work. It is a falsehood. Also, the true persecution of practitioners took place sometime in the beginning of the 20th Century during a period where Cuba was trying to de-Africanize its culture. Modern interpretations of how Palo interacted with both the church and Lucumi seems to stem more from this period than anything preceding it. Christianity became the official religion of the Kongo empire hundreds of years before massive amounts of slaves from the Kongo reached Cuba. Just because they adapted Christianity as the state religion does not mean that it is the same type of Christianity that was being practiced in Europe nor was it the same type of Christianity that we see today. Adapting Christianity does not mean they abandoned any or all elements of their indigenous traditions. Actually the opposite is true, they incorporated Christianity into their indigenous practice which was a characteristic of their culture. Palo is a Cuban creole Religion. It developed over hundreds of years of complicated history in Cuba to its current form. To try to look to contemporary Africa for a form of Palo that is more “original” or “traditional” or to try to reinvent it and strip it of other cultural influences to make it this way alludes to a belief that there is a better, purer way of doing things. This is nothing more than an illusion because all practices are always evolving and changing, they always have. As a matter of fact Kongo practices are not static, evolution is at the heart of Kongo practices. This doesn’t mean we have nothing to learn from our counterparts in Africa but we cannot forget that the end of slavery in the diaspora was the beginning of a reign of terror for the Belgian Congo under Leopold II which obliterated much of practices and beliefs that were there prior to this time. Over five hundred years have passed from the initial contact between Europeans and the Kongo. During that time much has changed in Africa. Much has changed in Cuba. We have much to learn, from eachother. Like many practitioners that are implementing changes and revisions and removing elements of Christianity from their practice I too have a low opinion of the Church. I do not believe that Jesus was the son of God, I do not know or care if he existed, nor do I believe in the Pope, priests, the Bible or the Trinity. I am well versed in Christian history and just as outraged by the role the Church played in the history of the slave trade and the oppression of people. I do however, believe in my forefathers. 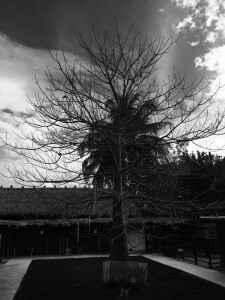 Those who live in the Caribbean or close to it will witness that during Lent impensu ndoki, the bad winds, tear through and dry out the leaves of the Ceiba, Nkunia Naribe, Mama Ngundu, the most sacred of all trees as well as many other trees that are common to work with in Palo, especially to heal. The seas also become extremely rough and this marks the end of shorter days and longer nights. To me these things mean that the good medicine becomes harder to find and Kalunga becomes so enraged that it is dangerous to step in her waters. After Holy Week the light begins to overcome the darkness as our daylight hours get considerably longer. Perhaps our ancestors didn’t simply observe Holy Week because of ignorance or societal constraints, perhaps they saw more to it than most of us do today, perhaps they found value in observing this week. We may never fully understand why they insisted to work by this calendar but I trust in their judgment.